Eagerly awaited for some time by the Flames Of War gaming community, the new 4th Edition of the rules is now here. Although compatible with many of the old supplements via a handy guide provided for free, Battlefront has decided to provide a focus for the release, looking at the Mid-War period in North Africa. So, in addition to a new rulebook, FOW players get two new supplements and a host of new miniatures. 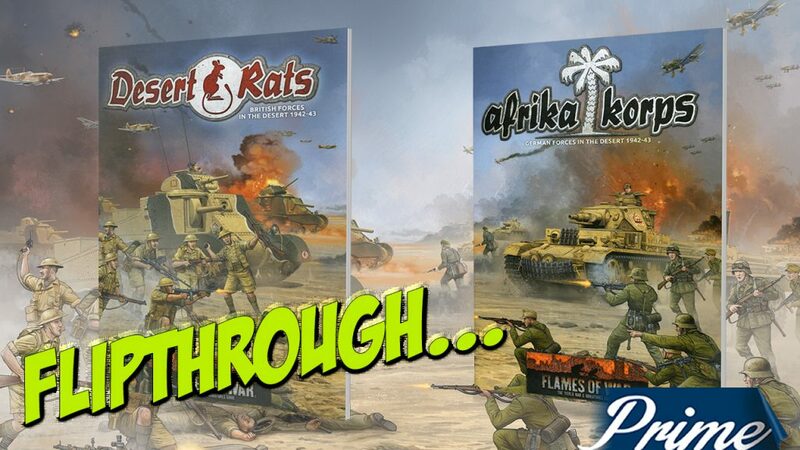 We’re going to take a look at the new Desert Rats and Afrika Korps books that have been produced. Desert Rats Book: The new Desert Rats book is designed to cover the period from 1942 until 1943. This is the crucial period for this area of operations, with the First and Second Battles of El Alamein and the eventual Allied push to destroy the Axis powers in the region. As always, the book contains an overview of the composition of a Desert Rats force, the relevant Special Rules and a clearly defined guide to the theatre of operations, including some of the pivotal battles. There are also handy guides to what makes a Mid War Allied army in the desert different to the Early War version. 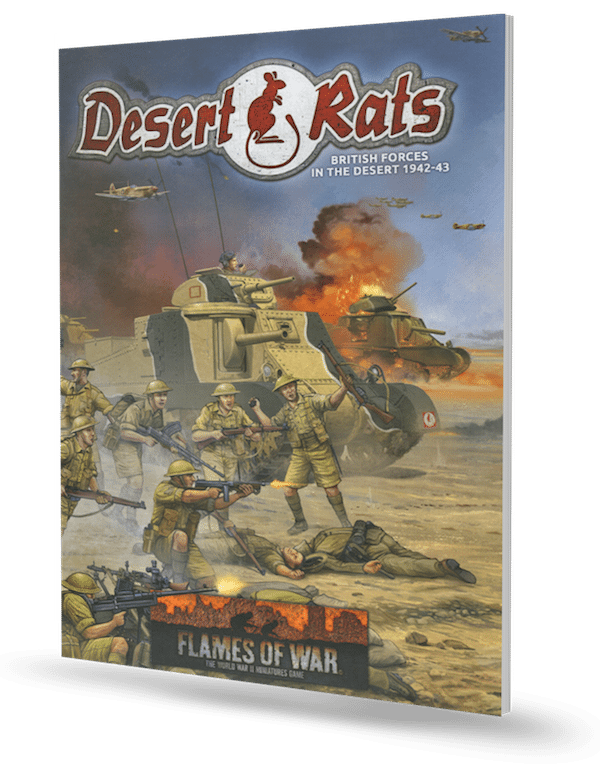 Know Your Tanks is a good visual guide to what you can field, and the trademark layout of the Desert Rats Force helps you get started with your options for collecting miniatures. 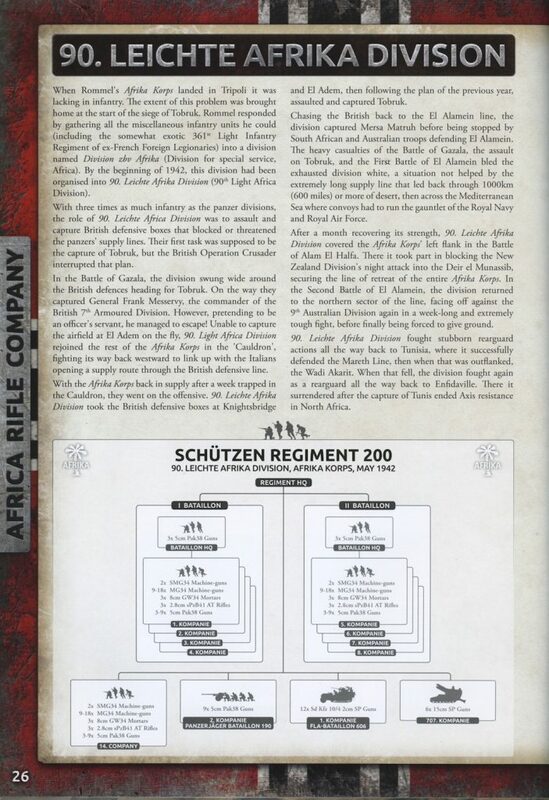 In addition to the ‘generic’ information about the Desert Rats Brigade, the supplement focuses on a number of key Regiments from this part of the war, like the 8th King’s Royal Hussars as shown here. Other units outlined in the book are the Royal Scots Greys, County of London Yeomanry and The Rifle Brigade. These forces provide players with examples of ‘types’ of unit they might wish to field, with all of them having a different role within the game. They are less ‘definitive’ units (many more were involved) and more ‘sample’ units that can help when planning out your purchases of the excellent new miniatures. There is a whole section dedicated to the use of Support Units, allowing the gamer even more options and the ability to add some additional models to their collection. Lastly, no FOW supplement would be complete without the incredibly useful painting guide, which covers tanks, infantry, aircraft and support weaponry from undercoat to basing. Afrika Korps Book: Not surprisingly, the new Afrika Korps book is designed to cover the same period from 1942 until 1943. Again, this is a crucial period for the Axis powers in the region. Again, Axis players receive a useful guide to the composition of an Afrika Korps force, the relevant Special Rules and a clearly defined guide to the theatre of operations, including some of the pivotal battles such as Alam El Halfa and Medenine. There are also handy guides to what makes a Mid War Axis army in the desert different to the Early War version. Know Your Panzers is another suitably visual guide to what you can field, and the trademark layout of the Afrika Korps Force helps you get started with your options for collecting miniatures. 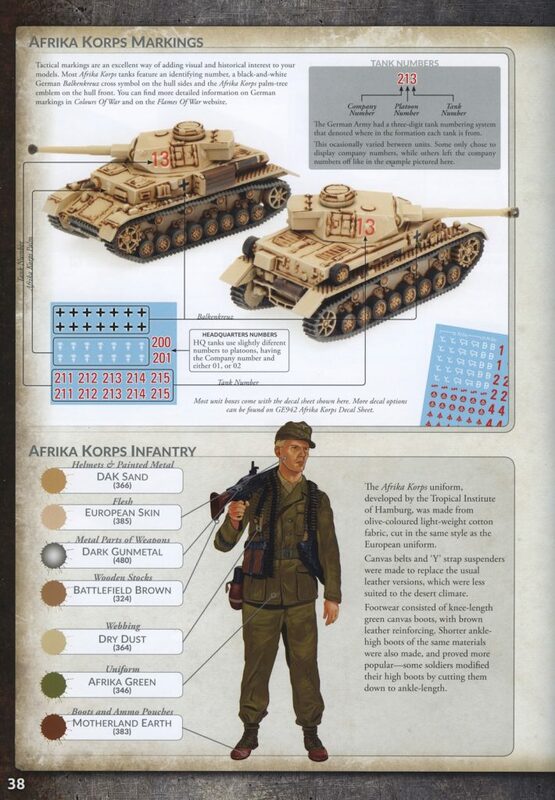 In addition to the ‘generic’ information about the Afrika Korps, the supplement focuses on a number of key Regiments from this part of the war, like the 90. Leichte Afrika Division as shown here but also other key units such as Panzer Regiment 8 and Panzer Regiment 5. These are, of course, ‘sample’ units, pivotal on the battlefield but more something to build your force around to match your style of play. 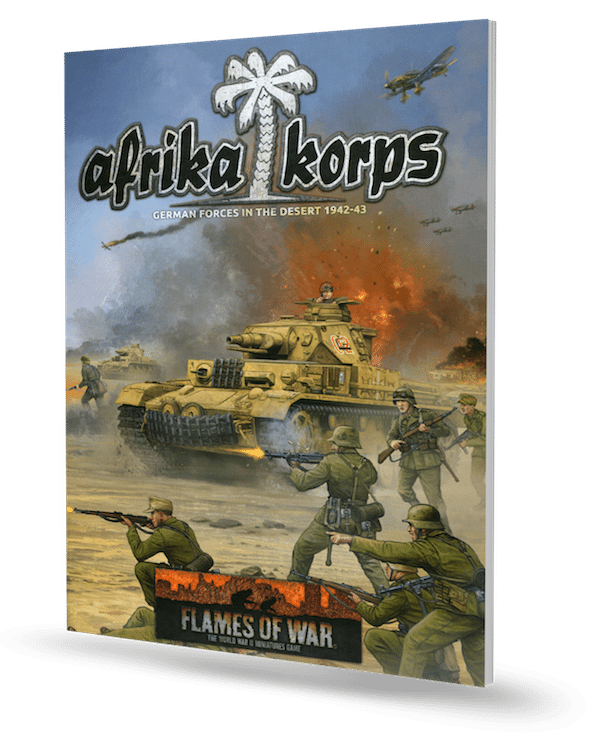 The Support Units section of this supplement allows for some of the ‘heavy hitters’ of the Afrika Korps to be deployed. There is the Tiger Mark I, the much feared ‘88mm’ Anti-Aircraft gun which was first used in the desert in an anti-tank role and the deadly Stuka, able to hunt with ease across the open desert. Once again, the options included allow the gamer plenty of opportunity to add some great models to their collection. This page onwards houses the standard painting guide, the usual well-researched and tried and true methods that can be employed to get those new miniatures onto the tabletop. 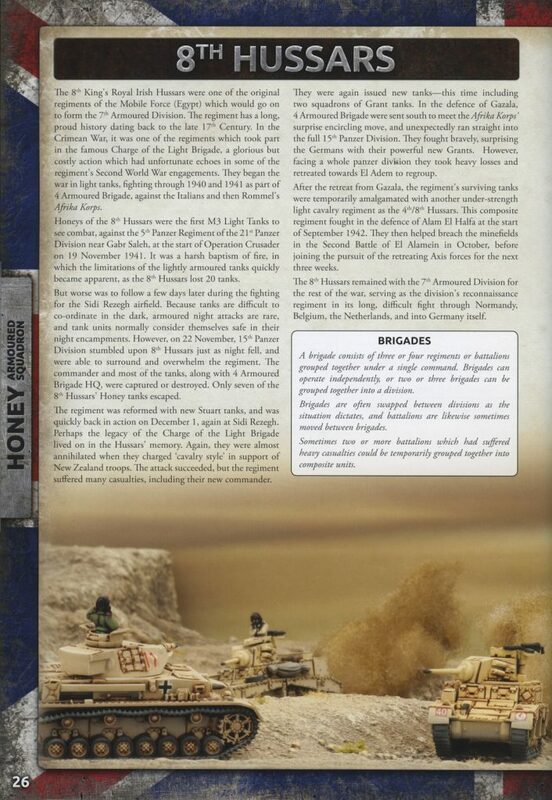 Covering tanks, infantry, aircraft and support weaponry from undercoat to basing, this is always one of the best parts of any FOW book and has helped many a ‘brush challenged’ player to field decent miniatures. In addition to the high quality photographs of miniatures and some great artwork, the overall look of each book is of a consistently high quality. Overall, if you have bought any of the Battlefront books before, you know what to expect. These are high quality, essential resources for Flames Of War players who are moving on to try the 4th Edition rules. The two supplements are also useful guides to the War in the Desert during World War Two for any gamer looking for inspiration or having problems dealing with the vast amounts of data available. A great deal of time, research and effort has gone into the production of these books, allowing the ‘time poor’ gamer to gain a rapid overview of what is required to field armies for this fascinating period of World War Two history.